It’s not quite a portrait of Wasabi, but it might be. He’s large and grey, and he sits on windowsills and watches the world go by, kind of like this cat. 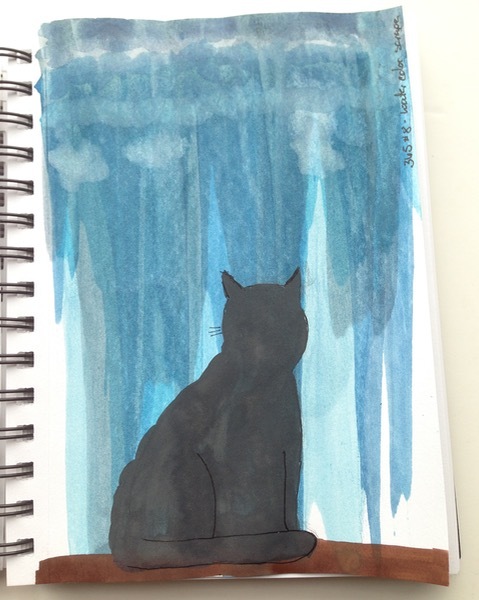 This was lesson #8 from my year-long online art class, and the focus was on the technique for the background. A couple of the projects so far have focused on the background, something I haven’t really given a whole lot of thought to in this context. The lessons have been about the technique, with tiny mentions of things we might do on top of them. It’s interesting how very background they feel and how I very much feel the need to do something, anything, on top of them; if I don’t, they feel incomplete. Is the point of the assignment, to whet the appetite, so to speak, to get started doing and then feel like continuing? Or are we going to be building skills forward? Can I look forward to better cats?